Keli Vadyakala Peedam conducted the Arangetam, ‘Kelikott 2018’, for its first batch students on October 26th at Co-operative Hall, Fintas. Chief Guest for the evening, Adv.Sumod inaugurated the function by lighting the traditional lamp. Famous traditional percussion artists from Kerala Neeleshwaram Nandakumar Marar, Neeleshwaram Pramod Marar and Vellinezhi Vijayan, well known morsing artist and an active social worker in Kuwait Manoj Mavelikara along with the Gurus of Keli, Neeleshwaram Sreerag Marar and Neeleshvaram Sreenadh Marar joined him on dais. Manoj Mavelikkara delivered the felicitation speech wishing Keli and its students a fruitful experience in the percussion field. Guru Neeleshvaram Sreerag delivered the welcome address and Guru Neeleshvaram Sreenadh gave the vote of Thanks. The Thayambaka Arangetamm of 3 brothers who are school students in Kuwait, Sudeep Sunil, Sandeep Sunil and Sujith Sunil, mesmerized the audience. Kelikott 2018 created history in the traditional percussion arena of Kuwait when 14 debut performers of age ranging from 7 to 57 including a lady with her son joined on stage for the Panchari Melam arangetam led by their Gurus Neeleshwaram Sreerag and Neeleshwaram Sreenadh with more than 14 accompanying artists. 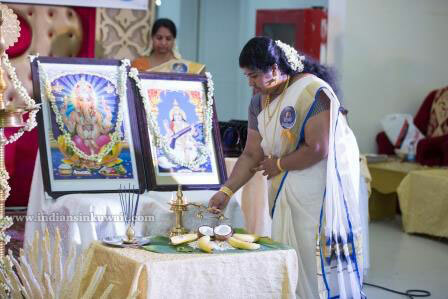 It is for the first time in Kuwait a lady is having Arangetam of traditional ‘Panchari Melam’. The debut performers were Abhinav Muralidharan, Dhyaan Krishna, Manoj Krishna, Ratheesh Kumbalath, Antony Joseph, Ajith Nair Harippad, Pradeep Kadambra, Baburaj Mandakathil, Kamal Radhakrishnan, Nithyan Kannur, Rajesh Kumar, Santhosh Kumar N, Sujith Chonamadam, and Reshmy Krishnakumar. Keli Vadyakala Peedam was inaugurated on the Vishu Day of 2017 at Abbassiya offering training on traditional percussion of Kerala including ‘Thayambaka’. The training pattern that is strictly based on the traditional framework makes Keli unique. Gurus of Keli, better known as ‘Neeleshvaram Brothers’, Neeleshwaram Sreerag Marar and Neeleshwaram Sreenadh Marar fall into the legacy of famous Kerala traditional percussion artist Padmasree Mattannur Sankarankutty Marar.